God is Great! All he does is excellent and worthy of praise and study. We believe that it is impossible to love God and hate his handiwork. This includes his work in salvation, his work in creation, his work in marriage and the family, and his work in the church. We desire at The Redeemed School of Biblical Studies to rigorously apply our heart, soul, mind and strength to the task of loving God by delighting in all His works. To that end we have developed a series of Bible and theology courses for those who want to know God in a deeper way. A vast knowledge of the New Testament (NT) is indispensable for the Christian seeking to grow in the grace and knowledge of the Lord Jesus Christ. The purpose, themes, outline, and key passages of each book in the New Testament. Some of the prevalent Issues of each book of the NT. Length: March 12 - May 28. Contact Pastor Kenny Kauffman for more information and let him know if you plan to attend. 1 John 2:6 says, "Whoever says he abides in him [Jesus] must walk in the same way in which he [Jesus] walked." By studying the Gospel of Mark your view of Jesus' life and ministry will be enriched and remind you of the walk which Jesus Christ walked. The contents of the Gospel of Mark through a chapter by chapter approach. A vast knowledge of the Old Testament (OT) is immensely beneficial in understanding the writings of the New Testament (NT). Many contemporary Christians are far more versed with the NT than the OT, if you want to better understand the NT than knowing the OT well is key. Some of the prevalent Issues of each OT book. Required Texts: Bible & note taking items. This course focuses on helping those who want to learn how to read, interpret, and apply the Bible in appropriate ways to their own lives and the lives of others. 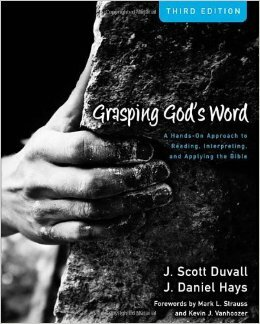 The basic tools for reading the Bible - understanding sentences, paragraphs, and discourses. Understanding where our English translation of the Bible comes form and the steps involved in getting into English. Understanding the literary, grammatical, historical, and cultural contexts of the Scriptures. Growing an awareness of things that we bring to the text that may cause us to interpret the text wrongly. Understanding the meaning of a text and where the meaning of a text comes from.